What was in the Newspapers and periodicals in 1976. Andros Bar, Great Western Road, breaks a world record. Blazes Bar, North Street, Charing Cross. Car crashes into Castle Bar, Drury Street. Connolly's Bar, Clydebank, Star of a Gracie Fields film. Dalriada Hotel, Edinburgh Road, Glasgow. Fiddling in the pubs of Glasgow. George Brown pub boss killed, and other bar managers assaulted. The first Glasgow ladies darts league. 1976. Winners of the ladies first darts league 1976. Derry Treaner fighting for title once again. Drinkers get extra hour drinking. Fallon's Ex-Celtic pub hit by blaze. The closing of the Kiwi Bar, Cowcaddens. The Lorne Bar, Duke Street, gets held- up. The New Orleans, Mill Street, Rutherglen, under new management. Peter Keenan talks about his career. 1976. Are pubs ready for an extra hour's drinking? It's a grim outlook for the man who likes a dram! Pubs open on a Sunday. Reo Stakis talks about his life. Monkey Business at the Stirling Castle Bar, Old Dumbarton Road. People keep going on about rising prices and about how wonderful life was in the old days when things were cheap. Of course things were cheap, and Iv'e been digging up some facts about how much or how little things cost in 1900. That was when tea cost 1s 4.5d per Ib., Danish butter 1s 2d per Ib., Rump steak 11d per Ib., and a leg of mutton 9d per Ib. A 4Ib loaf cost 3d and 7Ib of flour was 9.5b. Tobacco was 3d an ounce, or 4d for better quality, a good blend of Scotch whisky 3s 6d and a bottle of three star brandy 5s 11d. But what of the other side of the coin? A well-trained housemaid was well pleased with a wage of 7s a week with one day off, and girls straight from school were taken for training under a cook-general at a little over £2 A YEAR! 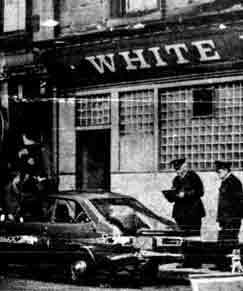 Do you know this public house on Dalmarnock Road?